Macrolane is an injectable hyaluronic acid gel, in a highly reticulated form; it is highly volumising, which enables the contours of the body to be restored without having to resort to more traditional surgery and is free of scarring. This gel is an implantable medical device, for which the CE marking has been obtained, and is manufactured by laboratoire Qmed. This product has been available in Europe since 2008. What is the lifespan of Macrolane? Macrolane is a resorbable product, which means it has an increased level of safety. However, the resorption of Macrolane is slow (one year to eighteen months). A reliable non-resorbable injectable filler does not currently exist, except for lipostructure, an autologous volumising filler (injection of autologous fat enriched with growth factor). Macrolane is not a product that is suitable for breast augmentations. The only techniques approved for a breast augmentation are: breast implants and lipofilling (injection of fat into the breasts). The treatment consists of an injection in the desired area to correct a lack of volume and to improve the contour of the body. The injection is performed with the help of low-diameter non-traumatic cannulas. Macrolane can only be used by Plastic Surgeons who have received specialist training. Results The results of a Macrolane injection are immediate and natural in appearance. Durability The result of a Macrolane injection is not permanent. It lasts between 12 and 18 months. Maintenance To maintain the effect, the Macrolane injections must be repeated every 12 to 18 months, but require a lower dose (25 to 50% of the initial volume). An injection of hyaluronic acid gel is always possible to restore corporal volume, including in very slim patients who do not have a sufficient quantity of fat to perform an injection of fat (lipofilling or lipostructure). Macrolane is an injectable filler that has a slow rate of absorption, which means that this product has a certain level of safety. 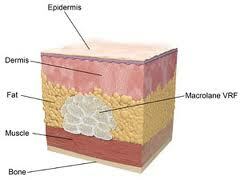 Macrolane is resorbable unlike lipofilling (injection of fat), however, its resorbable nature is also an advantage. Hospitalisation: for reasons of optimum safety Doctor Victor Médard de Chardon performs the injections in the operating theatre, in a sterile environment. The stay in the clinic is therefore very short (hospitalisation of several hours).